Review Type: Two decal sheets; eight page instructions. Advantages: Nice variety of markings for five subjects; perfectly printed; rich opaque colours. Conclusion: High quality and varied markings for Italeri's Mirage IIIE/R/O kit. In addition to printing high-quality markings for other decal companies, Fantasy Printshop also produces their own decals under the brand name of Euro Decals. Until recently these have tended to be national markings, serials and codes, and generic decals, but we are starting to see a flurry of decal releases for specific aircraft subjects. The latest of these cover 1/32 scale Mirage III subjects. 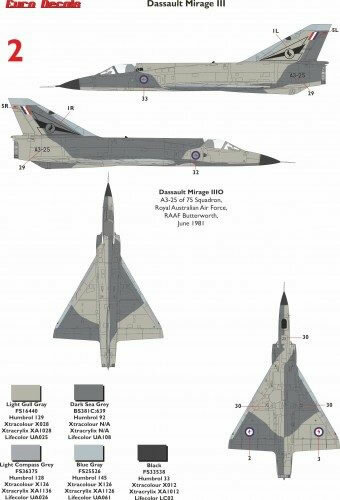 These will be suitable for the Italeri 1/32 scale Mirage IIIE/R/O kit. Markings are supplied for five subjects in a variety of finishes and colourful markings. It is quite a cosmopolitan collecton too, with four different nationalities on the single sheet. 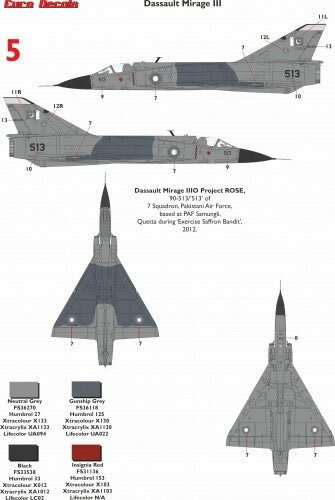 Dassault Mirage IIIO - Pakistan Air Force. Finished in Blue Grey upper fuselage, Ligh Compass Grey lower surfaces and Olive Drab and Sand upper wings. High visibility markings. Dassault Mirage IIIO - RAAF. Finished in an experimental low vis scheme of Light Gull Grey and Dark Sea Grey. High visibility markings excpet for the fuselage, where the white has been overpainted with grey. Dassault Mirage IIIO - Armee de l'Air. 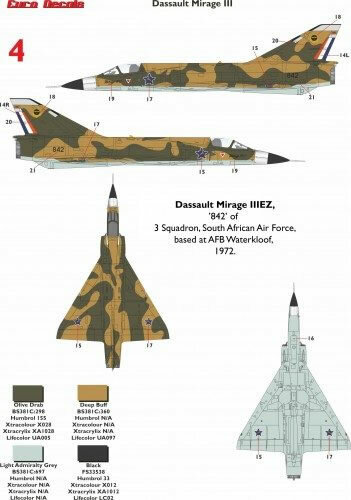 Finished in the classic Mirage III camouflage pattern on green and grey upper surfaces and painted Aluminium below. High visibility markings. 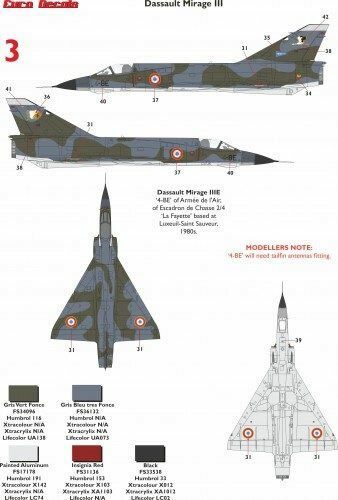 Dassault Mirage IIIO - SAAF. Finished in Olive Drab and Sand upper surfaces and Light Grey lower surfaces. High visibility markings. 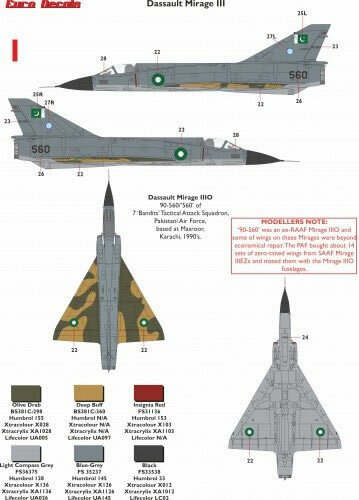 Dassault Mirage IIIO - Pakistan Air Force. Finished in a disruptive scheme of Neutral Grey and Gunship Grey with low visibility markings. National markings are provided for all the options, so you can finish five models with this good-value release. Instructions are supplied in an eight page stapled booklet with full colour four views and notes on each subject. Paint callouts for Humbrol, Xtracolor, Xtracrylix and Lifecolor are also included for each. The decal sheets are printed perfectly by Fantasy Printshop. Colours look great, and the glossy printing is in register. There are two A5-sized sheets. 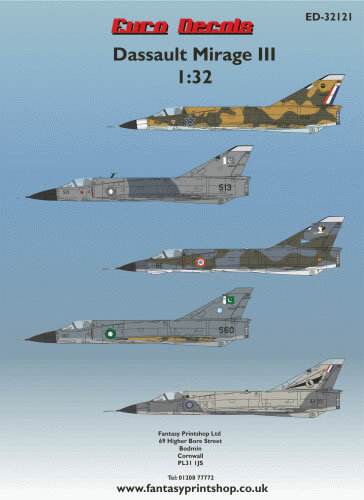 This is a very welcome release from Euro Decals for Italeri's 1/32 scale Mirage IIIE/R/O kit.